Arun Jaitley is an interesting leader. He is interesting not because he is not cut in the Laloo Prasad mode. He is well read and very articulate. Hearing him hold forth for BJP in the days when the party was a marginal player in Delhi’s power circuit was a delight just as it was a pain to attend the briefings of his senior Jaswant Singh. Unlike Singh, he had cut his teeth in student politics. His biggest plus is the fact that he is an unadulterated Delhiite. There is an old world charm in Jaitley-speak though he is a product of ABVP politics, like Muppavarapu Venkaiah Naidu, his contemporary, whose paronomasia invites brickbats and bouquets in equal measure. So much so, when Jaitely entered into a public spat with Justice Markandeya Katju, it sounded strange. A practising lawyer locking horns with a former apex court judge is an unusual spectacle. More unusual, of course, was Congress party’s Digvijay Singh quickly rallying in support of Katju. Two things have happened as a result. One the issue became politicised with the BJP and Congress locked in a war of words. Two the basic issue raised by Jaitley has been sidelined particularly with the sections of Talking Shops pitching their pitch a little too high to grab eye balls. Established names in the media, not all, but a majority, certainly, have not helped matters either. Their penchant to look at the Jaitely –Katju spat through political prism has something to do with a garrulous Gujarati, who is on a political mission to find answer to the question – Koham (Who am I) in time for the next national ballot. Frankly, I don’t hold a brief for the BJP leader. Nor do I hold a brief for Justice Katju either. But my question is can there be no space for an exchange of ideas- big and small without making the ideas a hostage to politics. 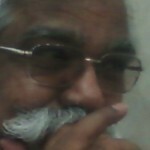 From Itanagar to Bhavnagar and from Sopore to Tuticorin, we come across the same sad spectacle – politicised discourse. For the ‘aam aadmi’ engaged in a daily struggle for existence politics matters very little till someone intrudes and touches raw emotions with rhetoric. Our politicians, irrespective of their labels, are full time practitioners of the art of the possible. So, there is nothing wrong in their jumping into the fray with or without provocation. But should we allow them to obfuscate issues with an eye on the elusive x- factor. Yes, there are no ready answers to this question which has been before us from late sixties when we had a brief tryst with coalitions and ‘Aya Ram- Gaya Ram’ politics in the Ganga-Yamuna belt. The politics of untouchability ushered in by Comrade Harkishan Singh Surjeet have erected firewalls; this has largely contributed to making a dialogue between the ruling and opposition parties a thing of the past. Today both sides speak through the media missing no opportunity to spite at each other. From Nehru to Rajiv Gandhi and PV Narasimha Rao, neither political moorings nor day-to-day political compulsions stood in the way of personal equations. It is not the case any longer as the Jaitley-Katju spat shows. Katju is not the first former Supreme Court judge to head the Press Council of India (PCI) with its office located very near a sports stadium. He will not be the last one to head this toothless wonder despite its quasi-judicial status. But, he is certainly the first PCI chairman, who is in the headlines with his ‘opinion pieces’. Now why he is offering his comments, mostly unsolicited, and why the media is giving him space are not germane to this column. The focus here is why should he rush to the press with his ‘op-eds’. It appears as though he wants to mold public opinion, like the newspapers whose output comes under the PCI purview. Otherwise, Justice Katju would not have written in The Hindu against the Gujarat Chief Minister. And concluded that he found it hard to believe Narendra Modi had no hand in the 2002 riots. Not only Justice Katju but many people with a thinking cap, do find it hard to believe that the Chief Minister was unaware of what was happening, for instance, at Gulburg Society, a Muslim housing complex, in Ahmadabad or about the Naroda Patiya massacre. Also most of us feel frustrated at the slow march of the wheels of justice in our country. Neither of these two sentiments should blind us to the reality that the law of the land is finally catching up with the guilty for the post-Godhra mayhem. 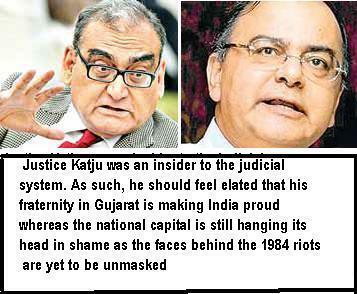 Justice Katju was an insider to the judicial system. As such, he should feel elated that his fraternity in Gujarat is making India proud whereas the national capital is still hanging its head in shame as the faces behind the 1984 riots are yet to be unmasked. Now whether Justice Katju’s remarks/observations are reckless or whether he is a megalomaniac is a matter of perception. Also, whether the PCI chairman was right in advising Jaitely to take ‘sanyas’ from politics and whether he was right in his run-ins with Nitish Kumar in Bihar and Mamata ‘Didi’ in West Bengal. The fact of the matter is a retired Supreme Court judge, who is heading a quasi-judicial body, has entered political space with his op-eds. Is this fair and proper? It is in finding answers to this question we can hope to carve out space for a healthy, unadulterated dialogue, which is the need of the hour. This question is important because we have a host of quasi-judicial bodies in the country. Equally important is another question that has come upfront with the ‘tapping’ of Arun Jaitley’s mobile phones. A Delhi policeman is held guilty along with his detective friend, who once helped the police and intelligence agencies, trace Afzal Guru, and other suspects in the 2001 parliament attack case. Yes, an op-ed piece on Jaitley’s tryst with mobile freedom will be interesting to read. This entry was posted in News and tagged Arun Jaitely, BJP, Katju, Media Freedom, Narendra Modi, politics, Press Counicl. Bookmark the permalink.